The Corrs are an Irish band that combine pop rock with traditional Irish themes within their music. The group consists of the Corr siblings, Andrea (lead vocals, tin whistle, ukulele), Sharon (violin, keyboards, vocals), Caroline (drums, percussion, piano, bodhrán, vocals), and Jim (guitar, piano, keyboards, vocals). They are from Dundalk, County Louth, Ireland. The Corrs have released seven studio albums and numerous singles, which have reached Platinum in many countries, and have sold 40 million albums worldwide. Talk on Corners, their most successful album to date, reached multi-Platinum status in Australia, and in the UK it was the highest selling album of 1998. The band is one of only a handful of acts who have held the top two positions simultaneously in the UK album charts, with Talk on Corners at number one and Forgiven, Not Forgotten at number two. The latter was the third highest selling album in Australia in 1996. Their third studio album, In Blue, went to number one in seventeen countries. The Corrs have been actively involved in philanthropic activities. They have performed in numerous charity concerts such as The Prince's Trust event in 2004 and Live 8 alongside Bono of U2 in 2005. The same year, they were awarded honorary MBEs for their contributions to music and charity. The band was inactive for almost 10 years because Jim and Caroline were raising families, while Andrea and Sharon were pursuing solo careers while raising families of their own. According to Sharon, it was uncertain if and when The Corrs would reunite. However, rumours of a reunion sparked in early 2015 and in a radio interview with Chris Evans in June 2015, Andrea confirmed that The Corrs were working on a new album and would play the BBC Radio 2 Live in Hyde Park festival. Their sixth studio album, White Light, was released on 27 November 2015, and was accompanied by a European tour. After two years, their seventh studio album, Jupiter Calling, was released on 10 November 2017. The Corrs are from Dundalk, County Louth in Ireland. While Caroline and Andrea were still attending school, Jim and Sharon began playing as a duo, often at McManus's, their aunt's pub. In 1990, Jim and Sharon added their younger siblings, to form a quartet. Their career took off in 1991 when they auditioned for the film The Commitments. Jim, Sharon and Caroline each had small parts as musicians, while Andrea had a speaking part as Sharon Rabbitte. John Hughes noticed them when they auditioned for the film and agreed to become their manager. In 1994, the American ambassador to Ireland, Jean Kennedy Smith, invited them to perform at the 1994 FIFA World Cup in Boston after seeing them play a gig at Whelan's Music Bar in Dublin. After an appearance at the 1996 Summer Olympics in Atlanta, United States, The Corrs joined Celine Dion's worldwide Falling Into You Around the World Tour as a supporting act. Jason Flom, Atlantic Records's head of A&R, recommended that they meet David Foster, a Canadian musician, producer, composer and arranger. The Corrs played live for Foster and he agreed to sign them to Atlantic Records. They extended their stay in the US for over five months to record their debut album, Forgiven, Not Forgotten. It featured six instrumental selections among its Celtic-influenced tracks. The album sold well in Ireland, Australia, Japan, Norway and Spain. Major success in the US and the UK, however, was not immediately forthcoming. Eventually, the album reached Platinum status in the UK and Australia, and 4× Platinum in Ireland, making it one of the most successful debuts by an Irish group. The Corrs' next album, 1997's Talk on Corners, was produced by Glen Ballard, who was respected for his collaboration with Alanis Morissette. The Corrs also collaborated with Carole Bayer Sager, Oliver Leiber, Rick Nowels and Billy Steinberg. It was successful in Ireland and the UK and entered the Australian album charts at number 3. After the band recorded a version of "Dreams" for a Fleetwood Mac tribute album, they re-released Talk on Corners, with new remixes of "What Can I Do? ", "So Young" and "Runaway". The special edition topped the charts worldwide and again reached multi-Platinum status in the UK and Australia. In June 1998, The Corrs participated in the Pavarotti and Friends for the Children of Liberia charity concert. The concert was held in Modena, Italy and was hosted by Luciano Pavarotti. Other performers included Jon Bon Jovi, Celine Dion, Spice Girls and Stevie Wonder. The concert aimed to raise money to build the Pavarotti and Friends Liberian Children's Village, to provide refuge for children in Liberia. The following year, The Corrs received a BRIT Award for Best International Band. They performed live on MTV's Unplugged on 5 October 1999 at Ardmore Studios, County Wicklow, Ireland. The resulting CD and DVD sold 2.7 million copies and featured live performances of previously released songs, plus a new song, "Radio", later featured on their third album, In Blue. In 2000, The Corrs returned to mainstream success with their third album. Unlike their previous albums, In Blue moved towards mainstream pop. In Blue hit number one in its first sales week in the UK, Ireland, Australia, Germany, Switzerland, Austria and debuted at No. 2 in France and Norway. It climbed to the top spot during its second week in Sweden and Spain. The Corrs worked with Alejandro Sanz on In Blue, recording "Una Noche (One Night)", a duet between Sanz and Andrea Corr; Sanz played Andrea's love interest in the music video. In return, The Corrs performed "Me Iré (The Hardest Day)" with him on his album, El Alma Al Aire. The Corrs collaborated with Robert Lange to produce a mainstream hit single, "Breathless", which reached number 20 in the Billboard Hot 100, number seven in Australia, number three in Ireland and New Zealand, and topped the charts in the UK. The album went straight to number one in the Irish Albums Chart, the third highest single-week sales in the history of the charts, behind U2's The Best of 1980–1990 and Oasis' Be Here Now. In Blue achieved Platinum sales in the US, double platinum in the UK, and 4× Platinum in Australia. During the production of the album, the Corrs' mother, Jean, died while waiting for a lung transplant. She was buried at St. Patrick's cemetery in Dundalk and Bono, Larry Mullen, Jr., Brian Kennedy and Paul Brady were among the congregation at the funeral. "No More Cry", written by Andrea and Caroline Corr for the album, was written to help their father get over his grief. In 2001, The Corrs released their first compilation album, Best of The Corrs. The album featured previously released songs and new tracks, such as the singles "Would You Be Happier? ", "Make You Mine" and "Lifting Me". The album did not chart highly in Ireland but reached Platinum status in Australia. The Corrs collaborated with Josh Groban, recording "Canto Alla Vita", for his eponymous debut album. When the band returned to Ireland, they hosted another live concert at Ardmore Studios, where they previously performed for the MTV's Unplugged series. Guest performers included Bono from U2 and Ronnie Wood from The Rolling Stones. During the concert, Bono joined Andrea Corr for a duet of Nancy Sinatra's "Summer Wine" and a performance of Ryan Adams' "When the Stars Go Blue". Ronnie Wood joined the band onstage to play guitar on their version of Jimi Hendrix's "Little Wing" and the Rolling Stones' "Ruby Tuesday". These performances were recorded and compiled on a live album, VH1 Presents: The Corrs, Live in Dublin, which was released in the UK. In 2003, Andrea Corr recorded "Time Enough for Tears", written by Bono and Gavin Friday for the film In America. This track was featured on The Corrs' 2004 album, Borrowed Heaven. Recorded over an 18-month period in Dublin and Los Angeles, Borrowed Heaven was produced by Olle Romo, who previously worked with Melanie C and Kelly Clarkson. The album marked The Corrs' return to the folk rock genre with a slightly heavier emphasis on guitars. Nevertheless, the album was not as successful as their predecessors, but at least successful enough to enter at No.2 in both the UK and Germany and reach silver status in the UK as well as gold in Germany. Jason Duffy temporarily joined the band as drummer, filling in for Caroline while she was pregnant with her second child and unable to tour. Borrowed Heaven was dedicated to the band's parents. The band also dedicated their 2005 album Home to their deceased mother. It is regarded as a traditional Irish album as the band covered traditional Irish songs taken from their mother's songbook to commemorate their 15 years as a band. The album was produced by Mitchell Froom and featured the BBC Radio 2 Orchestra. The songs on Home spanned the history of Irish music. It also included two songs in Irish, "Bríd Óg Ní Mháille (Brigid O'Malley)" and "Buachaill Ón Éirne (Boy from Lough Erne)". Home had success in Ireland, France (reaching No. 5) and Germany (reaching No. 12) and was certified silver in the UK. The Corrs went on an extended hiatus starting in 2006, raising their own families and pursuing solo careers. Andrea released her first solo album, Ten Feet High, on 25 June 2007. It was produced by Nellee Hooper, who has worked with Björk, Gwen Stefani and Madonna; Bono was an executive producer. The first single released from the album was "Shame on You (to Keep My Love from Me)". On 30 May 2011, Andrea released her second album, Lifelines, an album of cover songs, with The Blue Nile's "Tinseltown in the Rain" as the first single. Sharon started pursuing a solo career in 2009, her single "It's Not a Dream" was released on 29 August 2009. On 10 September 2010 her debut album Dream of You was released, with her cover of "Everybody's Got to Learn Sometime" by The Korgis as the first single. Sharon finished writing her second album in March 2012. The Corrs released their second compilation album, Dreams: The Ultimate Corrs Collection, on 20 November 2006. The album consisted of several of the band's hits, as well as tracks that had not previously been released on Corrs albums, such as "I Know My Love", a collaboration with The Chieftains and "All I Have to Do Is Dream", Andrea's duet with Laurent Voulzy. The album also featured remixes of "When the Stars Go Blue" and "Goodbye". The latter was released as a download-only single to promote the album. However, the album charted poorly, reaching number 24 in Ireland. On 25 September 2007, The Corrs released another compilation album, The Works. The album consists of three CDs that feature previously released songs. It performed worse than its predecessor, failing to chart at all. In June 2015, Andrea announced that the Corrs would perform at Live in Hyde Park on 13 September 2015 and were in the process of making a new record. On 17 September 2015, the band confirmed their sixth studio album, White Light, which was released on 27 November 2015 and was accompanied by a European tour, which took place in 2016. According to a new interview, released by Jim to Music Radar, the band had already completed the recording for their seventh studio album, Jupiter Calling. Produced by T Bone Burnett, it was released on 10 November 2017, and was preceded by a concert on 19 October at the Royal Albert Hall in London. When asked to describe their genre, Caroline Corr said it was a "blend of modern rhythms and technology with acoustic instruments, violin, tin whistle, drums and of course the voices, the marrying of these instruments is our sound". The Corrs' music is typically categorised as a mixture of pop rock and folk rock. This is evident in their first two albums, Forgiven, Not Forgotten and Talk on Corners, although Andrea described the genre of Talk on Corners by saying "it [has] got more of an edgy feel, a little bit more guitar-orientated and also an Irish sound, which is in Forgiven, Not Forgotten." In Blue moved towards mainstream pop, placing heavy emphasis on synthesizers. The move attracted criticism from many; one Entertainment Weekly critic called it "a disheartening example of musical ethnic cleansing". A USA Today critic called it "the best mainstream pop album you're likely to come across". Borrowed Heaven placed heavier emphasis on guitars, while retaining the original folk rock genre. Home is a traditional Irish album, where the band covered many traditional Irish songs. The album contained songs from different eras of Irish music, including a 1982 song written by Phil Lynott ("Old Town") while the 1,000-year-old "Return to Fingal" featured as a bonus track on the Japanese, limited German and Spanish editions. White Light returned to a similar sound to In Blue, with much more electronic-based instrumentation, while Jupiter Calling is characterized as a more stripped back live performance with minimal overdubbing. The Corrs' main influences were their parents who were musicians and encouraged them to learn instruments. They drew inspiration from musicians such as The Eagles, The Police, The Carpenters, Simon and Garfunkel and Fleetwood Mac, which Sharon said in an interview with CNN is the reason "our songs are very, very melodic and [harmonious]". The Corrs have been active in supporting charitable and philanthropic causes and disaster relief. In 1998, the Corrs participated in the Pavarotti and Friends for the Children of Liberia charity concert. The concert was held in Modena, Italy and was hosted by Luciano Pavarotti. Among the other participating artists were Jon Bon Jovi, Natalie Cole, Pino Daniele, Celine Dion, Florent Pagny, Eros Ramazzotti, Spice Girls, Vanessa L. Williams, Stevie Wonder, Trisha Yearwood and Zucchero. The concert raised money that was used to build the Pavarotti and Friends Liberian Children's Village and to provide a refuge for orphans in Liberia during the civil war. 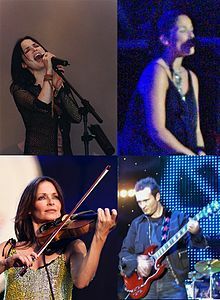 The Corrs, along with Sinéad O'Connor, Van Morrison, Boyzone, U2 and Enya held a charity concert in 1998, to raise money for the victims of the Omagh bombing in Northern Ireland. The Corrs' mother, Jean, died in Freeman Hospital in Newcastle, England. The Corrs showed their appreciation to the hospital by performing a one-off charity concert, held in 2001 at the Telewest Arena, raising more than £100,000. The money was used to extend the William Leech Centre of the hospital, which is dedicated to research into lung treatment. The city of Newcastle presented them a limited edition painting of Tyneside's quayside in return. The Corrs played at a 2004 charity concert for The Prince's Trust, a UK-based charity that provides help, training, financial, and practical support to UK citizens aged between 14 and 30. They performed with The Buggles, Will Young, Blue, Avril Lavigne, Lenny Kravitz, Busted, Anastacia, Nelly Furtado, Sugababes and Natasha Bedingfield and raised more than £1 million. They are ambassadors for the Nelson Mandela's "46664" campaign, where they performed live to raise awareness towards HIV/AIDS in Africa. The concert was held on 29 November 2003 in Cape Town, South Africa. The concert aimed to "[raise] awareness of HIV in South Africa and launched the 46664 campaign" and the money raised was donated to the Nelson Mandela Foundation for Aids. During the Edinburgh Live 8 on 2 July 2005, the Corrs performed "When the Stars Go Blue" alongside Bono to promote the Make Poverty History campaign, which aimed to increase awareness and pressure governments into taking actions towards relieving extreme poverty. In recognition of their charity work, The Corrs were made honorary Members of the Order of the British Empire in 2005 by Queen Elizabeth II. In late 1995, Anthony Drennan (lead guitar) and Keith Duffy (bass guitar) joined the band and remained a permanent part of the touring and recording line-up. When Drennan was released in early 1998 to tour with Genesis, his temporary replacement for two legs of the Talk on Corners tour was Irish guitarist Conor Brady. Jason Duffy, younger brother to Keith, joined the line-up as drummer for the Borrowed Heaven tour due to Caroline's pregnancy. Both Anthony Drennan and Keith Duffy re-joined the band for their 2015 return. Many of the Corrs' songs have charted at No. 1 in numerous countries. They won one BRIT Award, in 1999, and have twice been nominated for Meteor Music Awards, in 2005 and 2006. They were nominated for two Grammy awards in 2001 too: one for their song Breathless and for another one due to their instrumental song Rebel Heart. ^ a b c World Chart Positions. acharts.us. Retrieved 13 July 2007. ^ "The Corrs, Bono /U2/- When the Stars Go Blue, concert Live 8, Edinburgh, Scotland, UK, 6.7.2005". Youtube. Retrieved 2 February 2018. ^ "Honorary MBEs awarded to the Corrs". RTÉ Entertainment. 7 November 2005. Retrieved 2 November 2007. ^ "Sharon Corr: Rock chick and yummy mummy". Belfast Telegraph. 6 March 2012. ^ "BBC - Radio 2 Live in Hyde Park 2015". Retrieved 18 September 2015. ^ a b Wyatt, Daisy (17 September 2015). "The Corrs are coming back for a 2016 UK tour". The Independent. Retrieved 18 September 2015. ^ Cornwell, Jane (1999). The Corrs. London: Virgin Publishing Ltd. p. 23. ISBN 1-85227-840-4. ^ "The Corrs". Hello! Magazine. Retrieved 1 November 2007. ^ "The Commitments: Movie Information". The Commitments. Archived from the original on 17 November 2007. Retrieved 1 November 2007. ^ "The Biography Channel – The Corrs biography". The Biography Channel. Archived from the original on 29 May 2007. Retrieved 1 November 2007. ^ a b "The Corrs biography". Absolute Divas. Retrieved 7 December 2007. ^ a b "The Corrs". VH1.com. Retrieved 30 September 2011. ^ a b "The Corrs on MSN Music". Microsoft. Retrieved 7 December 2007. ^ "The Corrs pics". Askmen.com.au. Archived from the original on 8 May 2014. Retrieved 1 November 2007. ^ "David Foster Current Biography". Executive Visions. Archived from the original on 18 October 2007. Retrieved 7 December 2007. ^ Forgiven, Not Forgotten UK Certification Archived 30 September 2007 at the Wayback Machine. The BPI. 15 January 1999. Retrieved 14 July 2007. ^ Forgiven, Not Forgotten Australian Certification. ARIA. Retrieved 14 July 2007. ^ "Transcript: Profiles of Alanis Morissette, Margaret Cho". CNN People in the News. 4 January 2003. ^ a b c d "The Corrs Biography". goHastings.com. Archived from the original on 12 November 2007. Retrieved 1 November 2007. ^ a b "The Corrs biography". Bandbiographies.com. Archived from the original on 16 October 2007. Retrieved 1 November 2007. ^ Talk on Corners UK Certification Archived 30 September 2007 at the Wayback Machine. The BPI. 1 April 1999. Retrieved 14 July 2007. ^ Talk on Corners Australian Certification. ARIA. Retrieved 14 July 2007. ^ a b "iClassics". iClassics.com. Archived from the original on 7 August 2007. Retrieved 21 November 2007. ^ a b "Ally McBeal star sued by real life lawyers". BBC News. 15 October 1998. Retrieved 21 November 2007. ^ a b "The Songs of the Corrs". Universal Music Publishing Group. Retrieved 1 November 2007. ^ a b "The Corrs – Unplugged: DVD: The Corrs". Amazon.com. Retrieved 1 November 2007. ^ "The Corrs Unplugged (2000) (V)". IMDb. Retrieved 1 November 2007. ^ "The Corrs Eye U.S. Success". Billboard.com. 21 August 2000. Archived from the original on 4 November 2007. Retrieved 1 November 2007. ^ "Mutt Lange". Robert Lange. Retrieved 1 November 2001. ^ U.S. Singles Charts. AllMusic. Retrieved 14 July 2007. ^ Australian Chart Positions. australian-charts.com. Retrieved 13 July 2007. ^ Irish Singles Chart Searchable Database. The Irish Charts: All There is to Know. Retrieved 15 July 2007. ^ New Zealand Chart Positions. charts.org.na. Retrieved 13 July 2007. ^ "Corrs, tops in eight countries". Independent Newspaper. 4 August 2000. Archived from the original on 12 November 2007. Retrieved 1 November 2007. ^ RIAA Searchable Database Archived 26 June 2007 at the Wayback Machine. RIAA. Retrieved 14 July 2007. ^ In Blue UK Certification Archived 30 September 2007 at the Wayback Machine. The BPI. 17 November 2000. Retrieved 14 July 2007. ^ In Blue Australian Certification. ARIA. Retrieved 14 July 2007. ^ a b "Stars of music world gather to mourn with the Corr family". Independent Newspaper. 28 November 2000. Retrieved 1 November 2007. ^ Keogh, Elaine (29 November 1999). "Corrs share grief as mother is buried". Independent Newspaper. Retrieved 1 November 2007. ^ "Corrs' main frame". Atlantic Recording Corporation. Archived from the original on 17 November 2007. Retrieved 1 November 2007. ^ "Best of the Corrs: Music: Best of the Corrs". Amazon.com. Retrieved 1 November 2007. ^ Best of The Corrs Australian Certification. ARIA. Retrieved 14 July 2007. ^ "Josh Groban – Biography". Billboard.com. Retrieved 1 November 2007. ^ "Great Performances – Josh Groban in Concert – Singing Sensations". PBS. Retrieved 1 November 2007. ^ "Corrs concert' glittering cast". Independent Newspaper. 31 January 2002. Retrieved 1 November 2007. ^ "VH1 Presents The Corrs Live in Dublin: Music: The Corrs". Amazon.com. Retrieved 1 November 2007. ^ "Bono & Gavin Friday: 'Time Enough for Tears'". Showbiz Ireland. 4 November 2002. Retrieved 30 September 2011. ^ "In America (2002)". imdb.com. Retrieved 2 November 2007. ^ "'Borrowed Heaven' set to bring 'Summer Sunshine' for the Corrs". Independent Newspaper. 16 April 2004. Archived from the original on 12 November 2007. Retrieved 2 November 2007. ^ a b Uthayashanker, Uma. "The Corrs: Borrowed Heaven". MusicOMH.com. Archived from the original on 7 November 2007. Retrieved 2 November 2007. ^ Borrowed Heaven UK Certification Archived 30 September 2007 at the Wayback Machine. The BPI. 4 June 2004. Retrieved 14 July 2007. ^ "Planet Corr – Biography". Planet Corr. Archived from the original on 10 October 2007. Retrieved 2 November 2007. ^ Donaghy, Kathy (22 October 2002). "Caroline drums up delight over pregnancy". Independent Newspaper. Retrieved 2 November 2007. ^ "The Corrs & Heaven 'Borrowed Heaven' album". Music Remedy. Archived from the original on 13 January 2010. Retrieved 2 November 2007. ^ Maher, Gareth. "The Corrs's album 'Home'". CLUAS.com. Retrieved 2 November 2007. ^ a b Murphy, Hubert (16 September 2005). "Corrs make a return to Fingal". Fingal Independent. Archived from the original on 12 November 2007. Retrieved 2 November 2007. ^ Weisinger, Mark (7 March 2006). "The Corrs: Home". PopMatters.com. Retrieved 30 September 2011. ^ a b c "Corrs Home CD". Rhino.com. 22 November 2005. Archived from the original on 16 February 2006. Retrieved 2 November 2007. ^ Burriel, Raul (17 February 2006). "Music Review:The Corrs' Home". The Trades. Archived from the original on 12 November 2007. Retrieved 2 November 2007. ^ Home UK Certification Archived 30 September 2007 at the Wayback Machine. The BPI. 7 October 2005. Retrieved 14 July 2007. ^ Kilkelly, Daniel (25 March 2006). "No new material planned for The Corrs". Digital Spy. Archived from the original on 15 July 2006. Retrieved 2 August 2006. ^ Thomas, Charlie (8 May 2007). "Andrea Corr goes solo". Inthenews.co.uk. Archived from the original on 27 September 2007. Retrieved 2 November 2007. ^ "Andrea's New Album". The Corrs Official Website. 6 February 2007. Archived from the original on 28 February 2007. Retrieved 6 February 2007. ^ "Sharon Corr: Rock chick and yummy mummy". The Belfast Telegraph. 6 March 2012. Retrieved 15 March 2012. ^ "The Corrs are getting back together". The Journal. 9 June 2015. Retrieved 10 June 2015. ^ "The Corrs get back together after 9-year hiatus". inquirerdotnet. 17 June 2015. Retrieved 19 June 2015. ^ Peter McGoran. "The Corrs are back with new album Jupiter Calling". Hot Press. Dublin. ^ Luk, Vivien. "The Corrs – Borrowed Heaven". TheWorldly.org. Archived from the original on 9 May 2008. Retrieved 24 February 2008. ^ "CNN – 'Talk on Corners' reveals Irish band The Corrs". CNN. 28 July 1998. Retrieved 1 November 2007. ^ a b Egan, Barry. "The Corrs". Ireland's Sunday Independent. Archived from the original on 17 November 2007. Retrieved 24 February 2008. ^ a b Alexander, Brooke (22 March 1999). "Irish siblings take Britain, world by storm". CNN. Retrieved 24 February 2008. ^ "Meyer Sound News: Good Sound for a Good Cause – Pavarotti and Friends Charity Concert". Meyer Sound. August 1998. Archived from the original on 24 February 2008. Retrieved 23 February 2008. ^ "Pavarotti & Friends for the Children of Liberia". ArkivMusic. Retrieved 23 February 2008. ^ "Madonna pens bedtime story for charity". BBC. 10 November 1998. Retrieved 2 November 2007. ^ Rosen, Craig (12 January 2001). "The Corrs News on Yahoo". Yahoo. Archived from the original on 12 August 2011. Retrieved 23 February 2008. ^ "Corrs to perform concert for dead mum". Thomas Crosbie Holdings Limited. 8 January 2001. Archived from the original on 16 January 2009. Retrieved 23 February 2008. ^ McKiernan, Joseph (13 April 2001). "City honors the Corrs". Independent Newspaper. Retrieved 2 November 2007. ^ "The Prince's Trust". The Prince's Trust. Retrieved 23 February 2008. ^ "HRH attends the seventh Party in the Park in aid of The Prince's Trust". PrinceOfWales.gov.uk. 10 July 2004. Retrieved 23 February 2008. ^ O'Doherty, Caroline (8 November 2005). "Corrs left breathless over MBE honor". Irish Examiner. Archived from the original on 4 November 2007. Retrieved 2 November 2007. ^ "46664 – 1 minute for AIDS in South Africa". October 2007. Retrieved 2 November 2007. ^ "Live Aid's legacy of charity concerts". BBC. 30 June 2005. Retrieved 23 February 2008. ^ "Live 8 Concert". Live 8. Archived from the original on 7 November 2007. Retrieved 2 November 2007. ^ Ahern, Bertie (7 November 2005). "Award of Honorary MBE to the Corrs". Roinn an Taoisigh. Archived from the original on 11 August 2007. Retrieved 9 November 2005. ^ "The Brit Awards". Everyhit.com. Retrieved 2 October 2007. ^ "Meteor Music Awards nominations announced". RTÉ Entertainment. 11 January 2005. Retrieved 23 February 2008. ^ "Meteor Music Awards nominations announced". RTÉ Entertainment. 23 November 2005. Retrieved 23 February 2008.